One of the world’s most fearsome predators is on display at Mamba Village, East Africa’s largest crocodile farm. A typical day at Mamba Village begins with an informational video introducing the crocodile, its lifecycle and the important ecological role it plays. Visitors to the farm can observe crocodiles ranging from hatchlings to behemoth adults, including the supposedly 100-year-old Big Daddy. The highlight of the day occurs in the afternoon at feeding time, when the giant reptiles duke it out for fresh meat. The village also offers horse and camel rides, botanical gardens and a restaurant serving up grilled crocodile among other game meats. Crocodile feeding time occurs daily at 5pm. 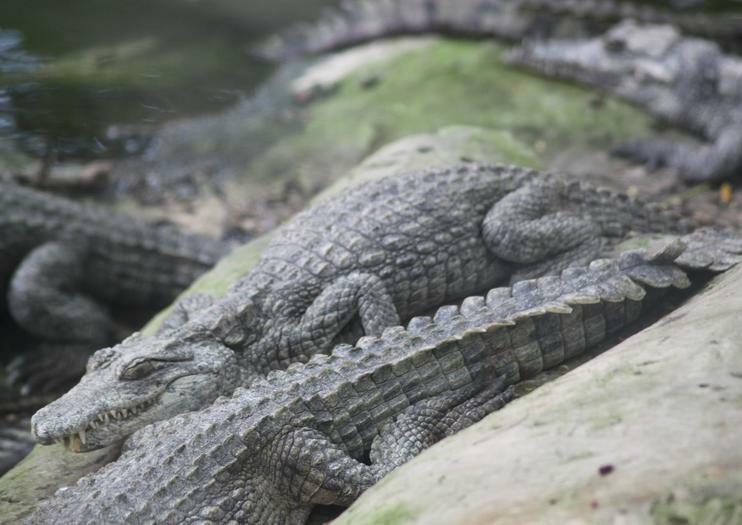 Spend the day at Haller Park wildlife sanctuary and Mamba Village Crocodile Farm, a family-friendly animal attraction. Get an educational look at a variety of species, including tortoises, hippos, giraffes, zebras and buffalo. Use your admission ticket for an up-close look at giant and baby crocodiles on a tour Kenya’s largest reptile farm. Learn about crocodile behavior from trained guides and watch the carnivore frenzy at feeding time! Includes round-trip transport from Mombasa hotels. Mombasa is famous for beach tours and relaxation. But in between your beach days, you can decide to familiarize yourself with famous touristic sites. Discover Mombasa’s diverse cultures and history on a full-day tour that explores cobblestone streets, vibrant markets, and local cuisine. With an experienced guide to introduce the best of the city, you’ll see the Fort Jesus Museum, old town’s Old Dhow Harbor, the Mombasa bazaar, the famous changamwe sovenirs workshops and more, pausing to shop for handmade souvenirs along the way. This guided Mombasa tour includes lunch at Tamarind Mombasa, a seaside restaurant that’s beloved for great seafood and views of the water.